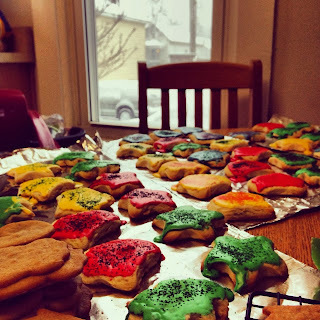 In the spirit of Christmas and holiday traditions, I spent Friday baking! The past three years, I have designated one day the week before finals to bake 3 different types of treats for my friends and roommates. Friday ended up being perfect because it was a snow day so there was the perfect winter backdrop to my cookie baking and decorating. 1. Cover a medium-large baking sheet with foil. 2. In a microwave safe bowl add in chocolate chips and 1 1/2 T oil. Heat in microwave in 20 second increments until melted, stirring in between. Mine took 1 minute. 3. Pour and spread chocolate on baking sheet, making sure it covers the whole pan. Place in fridge for 30 minutes to harden. 4. After chocolate has hardened, repeat step 2 with the white chocolate. Once melted, pour and spread over milk chocolate. 5. Cover white chocolate layer with Peppermint baking chips. 6. Harden in fridge for another 30 minutes and then crack into pieces. You can always use crushed candy canes instead! I liked the baking chips because they were a little softer. 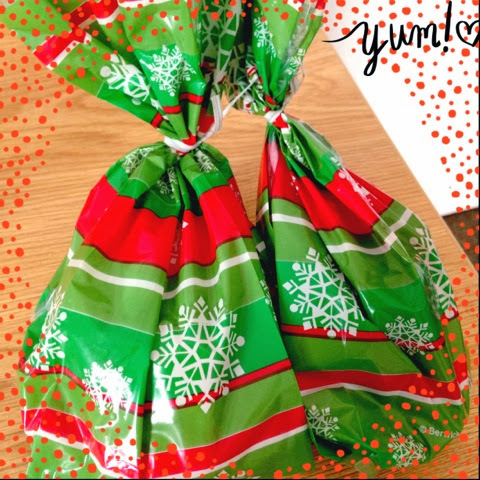 I packaged a mix of the cookies and bark in these cute little holiday bags and passed them out to my friends to wish them a Merry Christmas and good luck on finals. Hope everyone is enjoying their holiday season!